With our application downloaded locally, we can test out the build process by running docker-compose build ..
Our containers will then boot up, run our test suite, and exit. All of the tests should pass with flying colors. With a passing test suite in hand, we’ll now be able to move on to translating our setup for Codeship. With a local instance of our Dockerized application set up, we now can start building our Codeship build and deployment process. 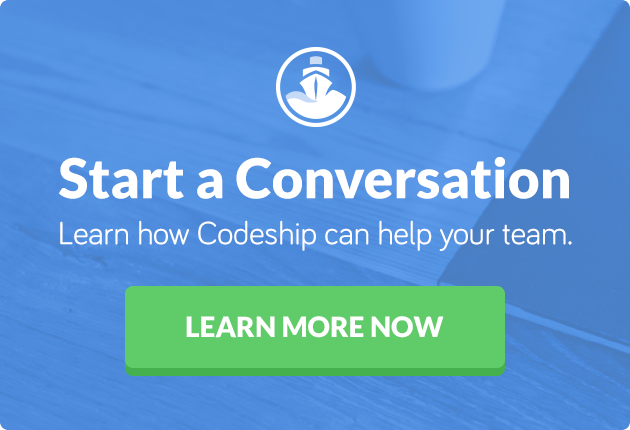 First, we’ll log into Codeship, navigate to the Projects tab, and create a new project. We’ll then select our method of Source Control (GitHub, Bitbucket, GitLab) and point Codeship toward our application. After our application connects, we’ll be presented with the option of making our project a Codeship Pro or Codeship Basic project. For this example, we’ll be running with Codeship Basic. Next up is the formulation of Setup Commands. Our setup for Node Express applications is formulated almost exactly as if were configuring our application locally without Docker. This command will run our NPM tests for our application on Codeship. Finally, we’ll navigate over to the Environment tab and set two variables for our project. Setting these variables gives two important pieces of information to our Codeship application. One is the database URL. We need to tell our application information about the database we’ve created. We also need to set the test environment of the application. With our Codeship CI pipeline in place, we can now save our setup steps and move on to testing the configuration! We can trigger a new build by committing new changes to your local project. With our passing Codeship build, we’ll now set up the Heroku deployment step in our pipeline. On our Codeship Project page, we’ll select Project Settings and click on the Deploy tab. With the API key copied, navigate to the Deploy tab under project settings. Find the Heroku tile and click on it. You’ll then be asked for your application name (as in, what it’s named on Heroku) and your API key. Fill out those fields and click Create Deployment.